If you’ve had trouble with Daviess County Public Library’s Freegal app in the past, it’s time to give it another try! Music is the ultimate way of helping us to define any situation or milestone in our lives. You can walk up to most people and ask them about particular aspects of their pasts and what was playing on the radio at that time. Generally speaking, they can probably answer in the affirmative that a particular song was popular during that moment in life. I truly tend to believe the phrase that I’ve heard years ago that music soothes the savage beast. I know most of us tend to have very busy lives and hectic schedules and sometimes we need to just be able to stop, be still in the moment and find that special piece of music that calls to our inner being. I know that music can come to the forefront in the most amazing ways too. For instance, the other night I was looking at Facebook and I tend to follow several different types of musicians or genres of music. As I was scrolling through, I noticed a mention of a group that I really liked back in the 80s when I was teenager. I opened the story about this group and it soon lead me to Youtube where I suddenly became fully entrenched in looking up and trying to remember songs from that time period by that band. Once I exhausted that list of music then soon I saw something about Sting and The Police. I was again transported to another time in my life when all that mattered was the music and the way it summoned up certain feelings that beckoned me to explore further. I hadn’t realized how long it had been since I had heard some of these songs and the different emotions that they stirred up within me. In any event, I believe we all have a desire to listen to some sort of music that transports us away from the mundane and takes us to a higher plane of realization and wonder. If you are like me and love music and are always looking for the next interesting piece of music then I have a great deal for you. If you haven’t heard of Freegal then you need to listen up. 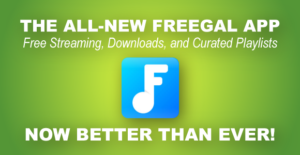 Freegal is a huge music database that runs the gamut from everything to rock, reggae, country, new age, pop, soul, and, drumroll please….Christmas music. Yes, you heard me right. The holiday season is upon us and if want the opportunity to get some free Christmas music that will be yours to keep forever, or until you get rid of the device you are using, then listen up for directions on how to use this wonderful database. First, go to www.dcplibrary.org. Second, click on the tab in the middle of the page that says: Online Resources. Once you are on the resources page you will need to enter your 14-digit library barcode number to authenticate your account. Now, scroll down to Freegal Music and click on that link. Third, now you are on a page that will ask you to type in some general information. Once you have done this, click Find Libraries. Fourth, now you will click on the library name that appears to the right of the page. Once you have done this you will now be on the DCPL Freegal Music library page. All you have to do now is type in your 14-digit library barcode number again to access this vast music catalog. Okay, are you still with me? Good. Now that you have logged in you can just start searching for various artists, songs, genres, etc. Once you find a song you are interested in then you click on the arrow to the right of it and it will ask you if you are sure you want to download the song. Once you click “yes” then you are on your way to owning a copy of this piece of music. The library limit per user for downloads is 5 songs per week. Once you have reached that limit, then you have to wait until the following Sunday night at midnight before it resets to allow you another 5 downloads. The next time you are in the mood for music but you don’t want to have to pay those pesky prices per song then you have access to a catalog holding over 9 million songs from over 28,000 different record labels including Sony. Oh, you can also download the Freegal music app and as long as you keep the app then you can keep the music. So, set your soul free with some powerful music and let your cares drift away. While in between sips (who am I kidding, GLASSES) of your mom’s boxed wine and Uncle Kenny’s heated political debate with Great-Aunt Muriel that climate change does, in fact, exist, you may want get away. You may want to hide underneath your childhood twin bed and have a good laugh. And that, my fellow conflict-avoidance friends, I can help you with. The best way to endure the craziness one’s family brings during the holidays is to find a household that is much more hectic than yours. The uproarious Running with Scissors: A Memoir by Augusten Burroughs is guaranteed to make your kin seem as calm as the untouched Brussels sprouts casserole created by next-door neighbor Nancy. Inside you’ll find a dysfunctional psychiatrist, a self-taught veterinarian, and a delicious amount of mommy issues. You will only want to put this down if you are certain there is a new batch of Sister Schubert rolls coming from the oven. Finally, is it time for Aunt Vivian to pull out her iPhone 3G to show pictures of her annual vacation to Sheboygan? Maybe you will need a little more time in your hideout (along with two slices of pumpkin pie and whatever is left in Grandpa Carl’s hip flask). For this, I suggest the amazingly witty show Shameless. You can relish in the fact that within the one hour it takes to watch your purse wasn’t stolen, you didn’t meet someone with a secret identity, and you didn’t walk in on an affair, and that is just the first episode. While you cannot pick the family you are born into, you can pick your downloads (and just how much “cheer” you put in your eggnog). All of the content above, as well as hundreds of books, graphic novels, audiobooks, music, movies, and television shows are available for free on the Hoopla app with your library card information. Perhaps your hiding place will become a home for hibernating all winter long, or at least during the holiday season.